Abbreviated description: Original WWII German concentration camp flag measures, approx 6 ft x 38 inches. Flag has original grommets and is of two piece construction with the white center portion sewn on to the red portion. The black symbol is printed. 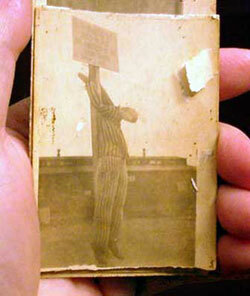 This flag was liberated from Buchenwald concentration camp by a U.S. GI towards the end of WWII. Included with this flag are five photos (original) taken at the time of the flag's liberation. 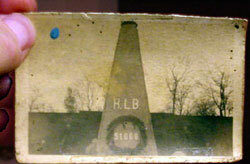 The photos show soldiers (including the original owner of this flag and photos) looking on at a pile of corpses, a monument at Buchenwald with the soldier's handwritten note on the back of the photo, a pile of bones/ashes, a torture device (hanging from the wrists) and a photo of the original owner in a camp with two of his buddies. 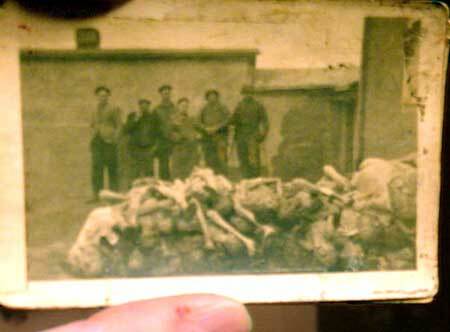 The same stack of bodies outside a building at Buchenwald was photographed on several occasions. Its number varies however. 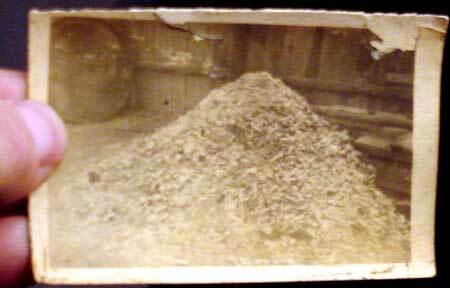 A pile of ashes and bones, presumably from Buchenwald's crematories.